The thing about winter in the UK is that it is cold. Freezing cold. On the spur of the moment after trudging through the snow to my London office I booked Exodus’ Week in Jordan. It sounded so perfect. Only five hours away from the UK, yet 15 degrees warmer. Jordan has history and culture in bucket loads and the itinerary meant I could really get under the skin of the country in a short time, and without having to fly halfway across the world. The trip began in the Greco-Roman city of Jerash, 30 miles north of the capital, where we spent several hours exploring well preserved monuments including the Temple of Artemis and Temple of Zeus. 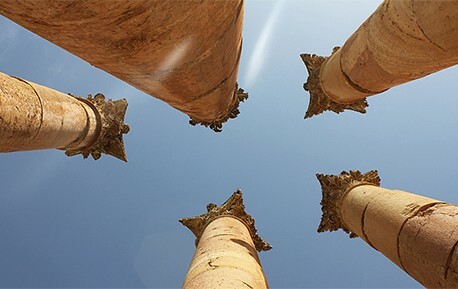 Buried under sand for centuries until being rediscovered in 1806, Jerash was famed as one of the ten wealthy self-governing cities of the Decapolis. With a long and colourful history, Jerash enjoyed a golden age with luminaries including Alexander the Great and Emperor Pompey amongst the visitors to this great city.